I love cooking soups in the winter, and would like for you to join me for some Black-Eyed Pea Soup. I don't think I even heard of black-eyed peas until I moved to Texas over 30 years ago. People in the south eat black-eyed peas for good luck on New Year's Day. My friend, Barbara, gave me this beautiful teacup awhile ago, and it's a favorite of mine. The pattern is Hazel Dell, by Copeland/Spode. Isn't it pretty? 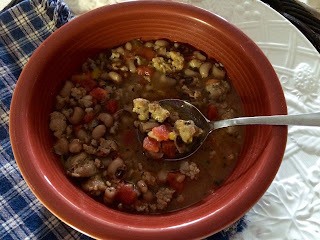 I copied this recipe down from the Today Show back in 2015, and adapted it to use canned beans. If you don't like black-eyed peas, try Great Northern beans, instead. It's a really quick, flavorful soup, and perfect for Winter. Add onion, bell pepper, garlic, and jalapeño and cook about 6 minutes. Add tomatoes, black-eyed peas, and broth. Simmer and then garnish with cilantro, if desired. This looks and sounds delicious, Kitty! I could eat soup twice a week (at least) in the winter -- I LOVE it!! This looks fairly easy, too, which is always a plus. ;) Your teacup is just gorgeous; I love the basketweave pattern in addition to the lovely flowers. What a sweet gift! Thanks for sharing this recipe, Kitty, and have a wonderful day!! 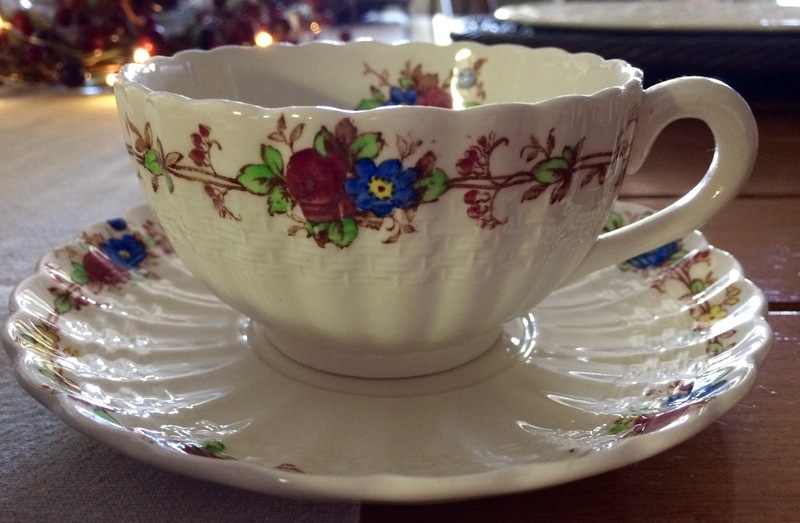 I have a Spode Fairy Dell teacup, same frilly appearance but the pattern varies slightly. I love love black eyed peas and make them regularly - always with some ham! Your recipe sounds wonderful! The ingredients in this soup look like a list of my son's favorite foods. We'll be trying it soon! Love this recipe, Kitty. The sausage is a wonderful addition. Such a pretty teacup too. Are you going crazy with this hot and cold weather we've had? You never know what to expect! The sausage sounds good... I have got to figure out something good for my leftover hambone frozen in the freezer. This will certainly be one that I will try, thank you. When I was a child we had black eyed peas on New Years Day, but that tradition has gone by the way side, not sure why or when. Your tea cup is stunning. I love the frilly look to it. Black-eyed peas are something I read about in novels set in the southern USA, but I've never eaten them. The soup does sound delicious, and beans, or maybe lentils, would be a good substitute. Soup really hits the spot on these chilly days. Kitty, we love the peas here so need to substitute. Sounds like a delicious recipe. Of course we cook peas on New Year's Day, love our southern traditions. Lovely cup and saucer. I've got a feeling that your soup is delicious! Like the other Canuck bloggers, I've never had black-eyed peas. Your friend has excellent taste in teacups! Your soup sounds delicious and I love black eyed peas. This sounds like a new recipe for me! Thanks so much. Love your tea cup too. Yum! Kitty, I have everything on hand to made this with Great Northern beans...add me to the list of folks who have never eaten black eyed peas! We're having a warmish Ohio day...near 58º...so I'll save it for when the temps dip again, which I know they will. This looks delicious. We make something very similar to this on New Year's Day. I could live on soup! I love all kinds and this looks delish! Kitty, your soup sounds wonderful! I must try some while it's Soup Weather! Kitty, your soup sounds delicious. I'm going to save the recipe. Thanks! 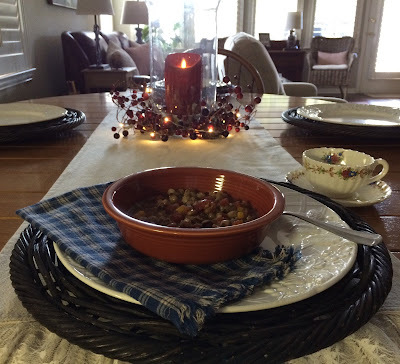 We finished the last of our blackeyed pea soup last week and made split pea soup. Definitely soup weather here. I have never of black eyed pea soup; it does sound delicious. I love that tea cup, Kitty! Hello Kitty, I never had black-eyed pea soup before. It sure sounds nice and perfect to eat in the winter! Thanks for sharing this at C&C with J&J. I'm born and raised in the north, but I love black-eyed peas so I'm sure I'd love this soup. I too like preparing soups in the winter months so I will give this a try. I read somewhere that southerners eat black-eyed peas on New Year's Day for good luck, so one year I made a black-eyed pea salad for our New Year's Day meal. My son declared he didn't like black-eyed peas and he'd take his chances for good luck without them! ;-) Happy New Year to you, Kitty! I am not a black eyed pea fan Kitty, and always dread the mandatory bite on New Year's Day, but your soup sounds delicious! Next year that's what we'll have! Your cup is beautiful! Love your gifted teacup set - it's beautiful - very thoughtful of her! Well, you may have changed my mind about black peas! I have never really liked them, but honestly, this recipe sounds like it is something I would enjoy, and for sure, I know my husband would love it. Thank you for sharing the recipe. Your tea cup is darling, love it, how sweet of a friend to gift it to you :) Hugs to you today! Love that cup of yours! It must make your afternoon tea taste marvelous!!! Can you believe I've never had or made Black eyed pea soup. Looks yummy! Thanks for sharing with SYC. this is a yummy recipe.. lovely for a winter night..
Kitty, I love just about every soup! Your soup sounds so delicious and perfect for winter! I love the Italian touch to your Black Eyed Pea Soup, that looks really delicious. Hope you are having a great day and thanks so much for sharing with Full Plate Thursday. Like many others, I have never had black eyed peas either. The spice sounds good. I made a stew with dumplings today. It's always nice on a winter day. Your frilly teacup is a pretty one. You have very thoughtful friends, Kitty.